Hello STEM and Science Friends! Are you ready for "What's Going on in the Lab?" I was scrolling through old blog posts a few days ago and came across the original version of this post - which made me revisit this product in my TpT store.... and oh my! 1. It's such a fabulous study! 2. Boy, did I need to update that product! In this post, for your convenience, you may find Amazon Affiliate links, which means Amazon compensates me if you purchase something through that link, at no extra cost to you. This helps keep this little blog running and helps fund give-aways! So, let's first talk about how spectacular this set of lessons is and what fun we had with it in the lab! It starts with a quick little experiment to introduce or review chemical changes. 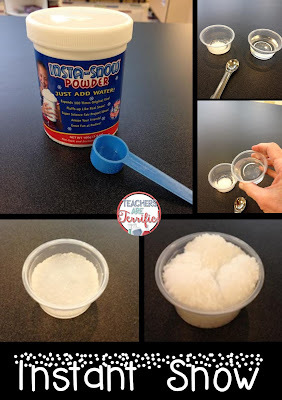 I am sure you know that baking soda and vinegar have quite a fizzing-popping-expanding reaction when mixed and many of your students also might know this. It is still just fun to see them dump baking soda in the bottle and see what happens. The lab sheet we complete about this has the kids predicting, writing, drawing, and then describing the science behind this chemical reaction. And, just because it is so much fun, here's a fantastic idea for your science class. Notice the kids in the photos above have on white lab coats! Well, these are so easy to make. Grab a package of boys' extra large t-shirts, lay the shirt flat, and cut right up the center of the front of the shirt, and bam! -you have a lab coat. To make this even more fun I make a name tag for each student with labels like this: Dr. Smith, Dr. Jones, etc. These slide into plastic badge holders they clip to their lab coats! And if you really want your kids to enjoy this call them by that name! The next lesson involves examining physical and chemical changes and learning how to tell them apart. 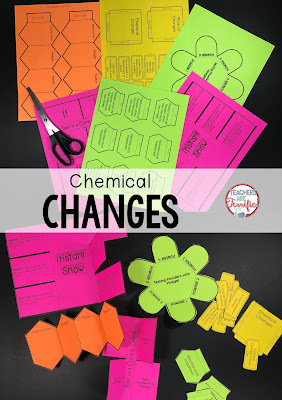 Kids complete a little sorting activity and then add those sorts to their lab sheet or notebook. This seems like such an easy sort, but the kids typically miss a few of these. They really don't know what "rust" is and maybe don't understand why an apple turns brown. So, the discussion is really eye-opening. Next, we take a close look at 6 powders. The powders are all somewhat similar in color and texture, with some differences. The main difference being that one of the powders will react to vinegar and the others will not. Kids drop little drops on the powders and record what happens. This leads to another great discussion of why some of the powders don't react. Above, you can see a student stirring the powder trying to make it dissolve. This is another great point of learning- stirring makes dissolving faster! And even better, we use a different toothpick for each powder! Do you know why? The best demonstration of a chemical reaction ever is called Elephant Toothpaste. The reaction is immediate and amazing. Kids love it and I usually have to repeat it so they can see it again. It's a little messy, but the kids can see a different reaction. This demonstration is followed by another card sort. 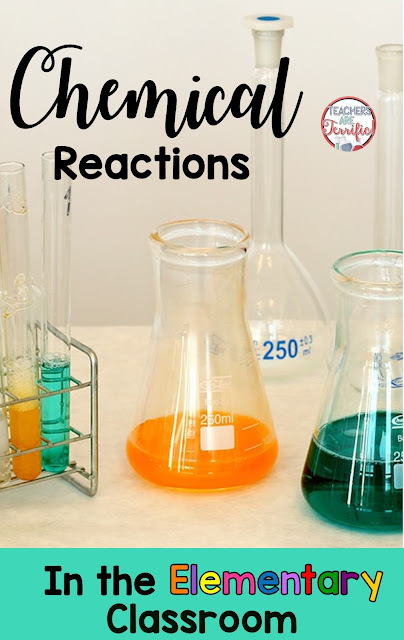 This one involves situation cards where the kids have to read about something that has happened and decide if it is a chemical or physical change. To extend this one and further assess their learning I have the kids work as partners and write their own situation. Here's the one that perplexed us: "Your dog is sick and dies in your backyard. After a few days you check on the body and notice what is happening to it. Is this a physical or chemical change?" Yes, third graders wrote that and we had a lively discussion of which type of change it is. Kids wanted to believe that it is physical because even though the dog is dead it is still a dog. True, but the decaying process is a chemical change! Finally, we culminate this study with Instant Snow. In this activity each student has his or her own cups to mix and the resulting "snow" is just cool to watch. Kids have to write whether the change in the snow is chemical or physical and give reasons for their thinking. I love reading what they have to say about this. So, where can you buy Instant Snow? Those are all different prices, but well worth the money for the finishing part of this great study of chemical reactions. So, there you have it- that's what we have been up to in the STEM Lab! What are you doing in science class? Can You Find Your Way Out of a Maze? 5 Amazing Solutions to Common Classroom Problems!